"Securitron Quality with a Wide Range of Options for Size, Color and Function"
- Select Function: PB5 (Illuminated) or PB5E (Non-Illuminated). - Delivery: The Securitron (PB5) Large Round Push Buttons are factory-ordered, please allow 3-4 working days' lead time. High-quality Securitron Push Buttons are available in a broad selection of colors, sizes, switch types and outputs. 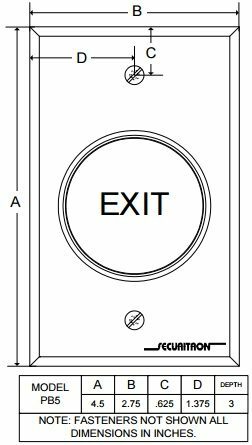 With a wide range of options for interchangeable lenses and field convertible outputs, Securitron push buttons can release any maglock, alone or in conjunction with door closers and other hardware. - 5 Amp rated contacts. - Includes interchangeable green, red, and blue ADA lenses. - Stainless Steel single gang plate: 4-1/2" x 2-3/4" [114mm x 70mm]. - Field convertible from DPST to DPDT. Momentary Switch: A momentary switch changes state during activation and reverts to its original state upon deactivation. A doorbell is a common example of a momentary switch. A timer can be used to extend the effect of the switch operation for a specific amount of time. Double Pole - Single Throw (DPST): Two SPST switches that operate in tandem using one switch operation so that two outputs turn on or off simultaneously in reaction to the switch operation. Double Pole - Double Throw (DPDT): Two SPDT switches that operate in tandem using one switch operation so that each connection shifts simultaneously from its primary output to its secondary output.